This recipe will surely gives you the reason why most of us love shrimps..my favorite seafood. Tempura is a Japanese dish of seafood that have been battered and deep fried. 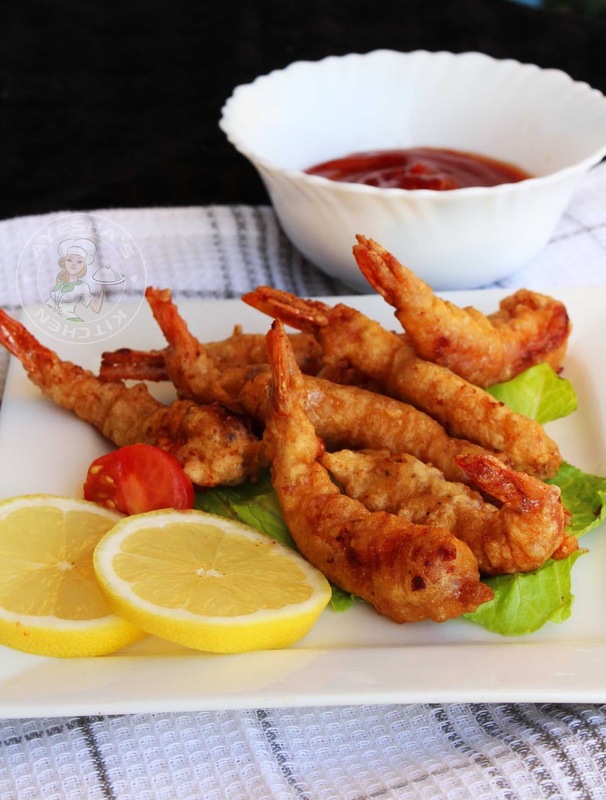 Prawns tempura / shrimp tempura is a deep fried shrimp recipe with a crispy crust and tender juicy meat inside. Tempura batter is made flour and other ingredients which is mixed with cold water to keep the batter light. For a unique fluffy and crispy structure, it is very important to leave lumps in the batter (do not ever over mix) along with cold batter temperature. The best tempura batter mix is often kept cold by adding ice. Tempura recipe generally does not use bread crumbs (panko bread crumbs) in the coating. Yes..This shrimp recipe is an excellent starter recipe for parties or functions. Starters, snacks or for lunch and dinner meal, shrimp recipes are simple, fast and easy. Do you know the reason why shrimp is considered as America's favorite seafood? Shrimp is one of the most protein dense food which is also an excellent source of selenium and an antioxidant mineral. You can also make chicken tempura recipe the same way. 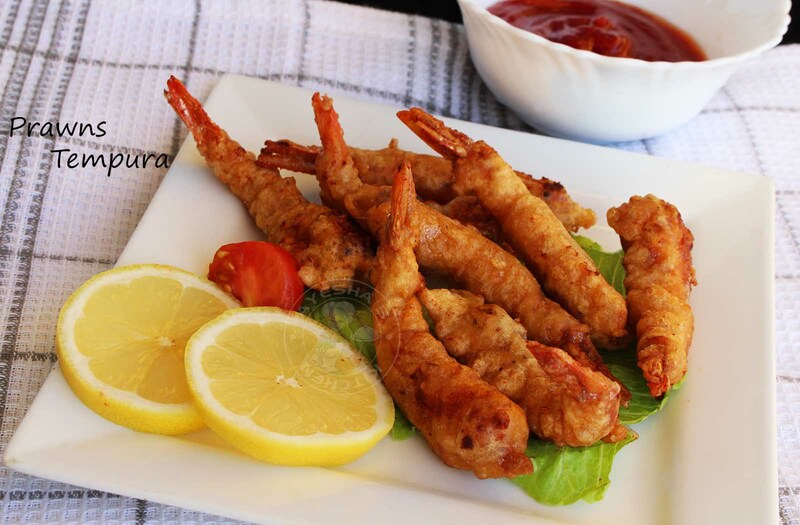 So lets move on to the recipe showing how to make tempura prawns / tempura shrimp / tempura batter recipe /fried prawns recipe / best deep fried shrimp recipe. So do try this easy japanese tempura recipe. Marinate the prawns with the ingredients given under for marination. Set aside. In another bowl, add quarter cup of all purpose flour and baking powder. Combine well with hand. Coat the marinated prawns with this dry flour mixture. Set aside. Combine together egg, two tablespoons of all purpose flour (maida), corn flour, garlic paste, soy sauce, pepper powder and salt in a bowl. Pour cold water little by little to mix it. Just mix roughly, no need of making smooth batter (it is to be noted). Mixture should not be too thick nor too thin. Heat oil for deep frying in a bottomed non stick frying pan. Once hot, dip the floured prawns one by one (by catching on its tail) in this prepared egg mixture and immediately put them to hot oil . Fry until both sides are done and crispy. Strain it to a paper towel and serve hot .